Just another of the variations on thogayal or chutney that are made in homes all over South India - and in homes all over the world wherever there are South Indians. This time I used cabbage - green cabbage, which made my thogayal look quite pretty with little green flecks from the cabbage and little red flecks from the dried red chillies and golden bits of fried urad dal. Thogayal in general is really best when eaten fresh - keeping it in the fridge overnight detracts a lot from taste and texture. Well, that's my opinion and the reason why I mostly only make enough to last a day or, at the most, two. Yummy mixed with rice, perfect for dosas as an accompaniment and have I mentioned that I LURVE thogayal sandwiches? Yep, with buttered bread! (Call me weird, I dont mind). 1. 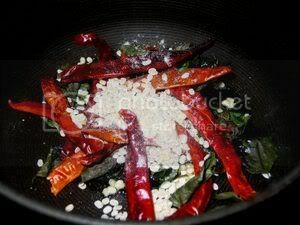 Heat the oil in a small pan and fry the urad dal, red chillies and curry leaves till the dal turns golden red. 2. 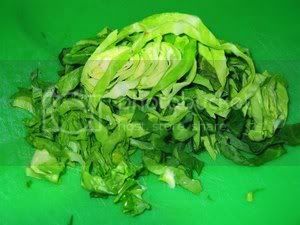 Now add the the sliced cabbage and saute for 2-3 minutes on medium-high or till it begins to wilt. 3. 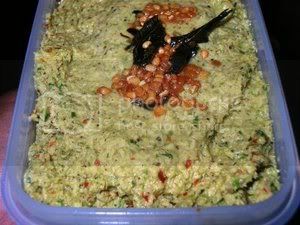 Cool slightly, then transfer the cabbage and seasoning to a mixie and grind along with the grated coconut and tamarind, using water as required to make a thick paste. Try to keep water addition to a minimum. 4. Add salt to taste and the reserved urad dal tempering, and mix well. A good side dish for chapaties, puris, bread, rice, dosas, etc. I have never tried cabbage togayal. Yours looks really nice. I make my togayal the same way by reserving some fried urad dal. I like my togayal a little crunchy. Will definitely try this. Is this the same dish that you mentioned in one of your comments at my blog? Where one can use harder cabbage leaves too? Wow !! Very very interesting dish.. I really never liked cabbage much because i thought nothing much could be made other than coleslaw .. but this really looks yummy ..Is togayal a sandwich spread or a chutney?? and after reading krithika's comment it appears it can be made using other ingredients too. If so what else is used?? I like Cabbage Thogayal very much. I will try your version soon. Thanx for sharing. 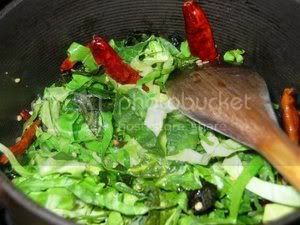 Interesting recipe Shammi never would have thought of using cabbage for thogayal if not for your recipe. I tried this recipe and turned out great. Thanks Shammi. Nevertheless,I'd like to start putting up more recipes and making it a semi-food blog.Where and how can I contribute to the ARF/Five a day thingy that you mention in your blog?Or is it an exclusive foodie thing?Thanks for the info and the delicious recipes!! Wow! Nice pictures. Never tried cabbage chutney. I cannot click on the snack items from your recipe categories. Can you please check it? Other categories are working fine. Thanks. Vaishali: Yep, this is the chutney I'd mentioned. :) Nicer if you use tender cabbage leaves, of course! Eve: Thogayal is a chutney - usually mixed with rice and ghee, or used as a side dish for dosa, idlis, etc. I like it as a sandwich spread too... but it might not appeal to everybody :) You can substitute the cabbage with the same amount of thinly sliced chayote squash, ridge gourd peel, zucchini peel, etc. Parvathi: Hi, the ARF/5-a-day event is open to anybody who wants to contribute a recipe :) It's organised by Cate (http://sweetnicks.blogspot.com) for the Tuesday of every week. All you need to do is email her the link to your recipe by Monday and she'll include it in her round-up. RP: I've checked the link to the Snacks section and made the correction :) Thank you very much for pointing it out! Shammi, cabbage and urad dal is my favorite combos. I make a salad with the two. Now i'll try this chutney too. Thanks a lot Shammi..I tried this and it came out really well...Never knew that you could prepare cabbage thogayal..A wonderful addition to my culinary skills.. Thanks you so much. I tried it came out well. Posted a link to your blog. Hooray - my postcard is here at last!